But still there was no progress. Nobody else was able to reproduce the problem, and even DeeDee_Z had trouble making it happen reliably. And then on August 12, more than three weeks after the bug report was filed, Peter Van der Beken commented that he had seen similar behaviour on his machine, and by adding some logging to Firefox’s guts he had a strong suspicion that it was related to having the “keep until” setting for cookies set to “ask me every time”. DeeDee_Z had the same setting, and quickly confirmed that changing it fixed the problem. Hooray! The patch makes the dialog for allowing/denying cookies actually show up when a cookie is set through the DOM API. Without the patch the dialog is created, but never shown and so it sticks around forever. This fix is on track to ship in Firefox 34, which is due to be released in late November. There are a number of takeaway lessons from this story. First, a determined bug reporter is enormously helpful. I often see vague complaints about Firefox on websites (or even in Bugzilla) with no responses to follow-up questions. In contrast, DeeDee_Z’s initial complaint was reasonably detailed. More importantly, s/he did all the follow-up steps that people asked her/him to do, both on Reddit and in Bugzilla. The about:memory data made it clear it was some kind of window leak, and although the follow-up diagnostic steps didn’t lead to the fix in this case, they did help rule out a number of possibilities. Also, DeeDee_Z was extremely quick to confirm that Peter’s suggestion about the cookie setting fixed the problem, which was very helpful. Second, many (most?) problems don’t affect everyone. This was quite a nasty problem, but the “ask me every time” setting is not commonly used because causes lots of dialogs to pop up, which few users have the patience to deal with. It’s very common that people have a problem with Firefox (or any other piece of software), incorrectly assume that it affects everyone else equally, and conclude with “I can’t believe anybody uses this thing”. I call this “your experience is not universal“. This is particular true for web browsers, which unfortunately are enormously complicated and have many combinations of settings get little or no testing. Third, and relatedly, it’s difficult to fix problems that you can’t reproduce. It’s only because Peter could reproduce the problem that he was able to do the logging that led him to the solution. Fourth, it’s important to file bug reports in Bugzilla. Bugzilla is effectively the Mozilla project’s memory, and it’s monitored by many contributors. The visibility of a bug report in Bugzilla is vastly higher than a random complaint on some other website. If the bug report hadn’t been in Bugzilla, Peter wouldn’t have stumbled across it. So even if he had fixed it, DeeDee_Z wouldn’t have known and probably would have had been stuck with the problem until Firefox 34 came out. That’s assuming s/he didn’t switch to a different browser in the meantime. Fifth, Mozilla does care about memory usage, particularly cases where memory usage balloons unreasonably. We’ve had a project called MemShrink running for more than three years now. We’ve fixed hundreds of problems, big and small, and continue to do so. Please use about:memory to start the diagnosis, and add the “[MemShrink]” tag to any bug reports in Bugzilla that relate to memory usage, and we will triage them in our fortnightly MemShrink meetings. Finally, luck plays a part. I don’t often look at /r/firefox, and I could have easily missed DeeDee_Z’s complaint. Also, it was lucky that Peter found the bug in Bugzilla. Many tricky bugs don’t get resolved this quickly. Big news: late last week, generational garbage collection landed. It was backed out at first due to some test failures, but then re-landed and appears to have stuck. This helps with performance. There are certain workloads where generational GC makes the code run much faster, and Firefox hasn’t been able to keep up with Chrome on these. For example, it has made Firefox slightly faster on the Octane benchmark, and there is apparently quite a bit of headroom for additional improvements. Interestingly, its effect on memory usage has been small. I was hoping that the early filtering of many short-lived objects would make the tenured heap grow more slowly and thus reduce memory usage, but the addition of other structures (such as the nursery and store buffers) appears to have balanced that out. The changes to the graphs at AWSY have been all within the noise, with the exception of the “Fresh start” and “Fresh start [+30s]” measurements in the “explicit” graph, both of which ticked up slightly. This isn’t cause for concern, however, because the corresponding “resident” graph hasn’t increased accordingly, and “resident” is the real metric of interest. “Compacting Generational GC” is the #1 item on the current MemShrink “Big Ticket Items” list. Hopefully the “compacting” part of that, which still remains to be done, will produce some sizeable memory wins. TL;DR: Firefox’s built-in PDF viewer is on track to gain some drastic improvements in memory consumption and speed when Firefox 29 is released in late April. This is a wonderful feature that makes the reading of PDFs on websites much less disruptive. However, pdf.js unfortunately suffers at times from high memory consumption. Enough, in fact, that it is currently the #5 item on the MemShrink project’s “big ticket items” list. Recently, I made four improvements to pdf.js, each of which reduces its memory consumption greatly on certain kinds of PDF documents. The first improvement involved documents that use image masks, which are bitmaps that augment an image and dictate which pixels of the image should be drawn. Previously, the 1-bit-per-pixel (a.k.a 1bpp) image mask data was being expanded into 32bpp RGBA form (a typed array) in a web worker, such that every RGB element was 0 and the A element was either 0 or 255. This typed array was then passed to the main thread, which copied the data into an ImageData object and then put that data to a canvas. The change was simple: instead of expanding the bitmap in the worker, just transfer it as-is to the main thread, and expand its contents directly into the ImageData object. This removes the RGBA typed array entirely. I tested two documents on my Linux desktop, using a 64-bit trunk build of Firefox. Initially, when loading and then scrolling through the documents, physical memory consumption peaked at about 650 MiB for one document and about 800 MiB for the other. (The measurements varied somewhat from run to run, but were typically within 10 or 20 MiB of those numbers.) After making the improvement, the peak for both documents was about 400 MiB. The second improvement involved documents that use images. This includes scanned documents, which consist purely of one image per page. Previously, we would make five copies of the 32bpp RGBA data for every image. The web worker would decode the image’s colour data (which can be in several different colour forms: RGB, grayscale, CMYK, etc.) from the PDF file into a 24bpp RGB typed array, and the opacity (a.k.a. alpha) data into an 8bpp A array. The main thread then created an ImageData object of the same dimensions as the typed array, and copied the typed array’s contents into it. The main thread then called putImageData() on the ImageData object. The C++ code within Gecko that implements putImageData() then created a new gfxImageSurface object and copied the data into it. Finally, the C++ code also created a Cairo surface from the gfxImageSurface. The change was in two parts. The first part involved putting the image data to the canvas in tiny strips, rather than doing the whole image at once. This was a fairly simple change, and it allowed copies 3, 4 and 5 to be reduced to a tiny fraction of their former size (typically 100x or more smaller). Fortunately, this caused no slow-down. The second part involved decoding the colour and opacity data directly into a 32bpp RGBA array in simple cases (e.g. when no resizing is involved), skipping the creation of the intermediate RGB and A arrays. This was fiddly, but not too difficult. If you scan a US letter document at 300 dpi, you get about 8.4 million pixels, which is about 1 MiB of data. (A4 paper is slightly larger.) If you expand this 1bpp data to 32bpp, you get about 32 MiB per page. So if you reduce five copies of this data to one, you avoid about 128 MiB of allocations per page. The third improvement also involved images. Avoiding unnecessary RGBA copies seemed like a big win, but when I scrolled through large scanned documents the memory consumption still grew quickly as I scrolled through more pages. I eventually realized that although four of those five copies had been short-lived, one of them was very long-lived. More specifically, once you scroll past a page, its RGBA data is held onto until all pages that are subsequently scrolled past have been decoded. (The memory is eventually freed; it just takes longer than we’d like.) And fixing it is not easy, because it involves page-prioritization code isn’t easy to change without hurting other aspects of pdf.js’s performance. However, I was able to optimize the common case of simple (e.g. unmasked, with no resizing) black and white images. Instead of expanding the 1bpp image data to 32bpp RGBA form in the web worker and passing that to the main thread, the code now just passes the 1bpp form directly. (Yep, that’s the same optimization that I used for the image masks.) The main thread can now handle both forms, and for the 1bpp form the expansion to the 32bpp form also only happens in tiny strips. I used a 226 page scanned document to test this. At about 34 MiB per page, that’s over 7,200 MiB of pixel data when expanded to 32bpp RGBA form. And sure enough, prior to my change, scrolling quickly through the whole document caused Firefox’s physical memory consumption to reach about 7,800 MiB. With the fix applied, this number reduced to about 700 MiB. Furthermore, the time taken to render the final page dropped from about 200 seconds to about 25 seconds. Big wins! The same optimization could be done for some non-black and white images (though the improvement will be smaller). But all the examples from bug reports were black and white, so that’s all I’ve done for now. On a 4,155 page PDF, this change reduced the peak memory consumption during file loading from about 1130 MiB to about 800 MiB. First I had to choose some test cases. Fortunately, this was easy, because we had numerous bug reports about high memory consumption which included test files. So I just used them. To answer this question, I introduced the following new function. I used a different second argument for each instance. With this in place, when the code ran, I got a line printed for every allocation, identifying its length and location. With a small amount of post-processing, it was easy to identify which parts of the code were allocating large typed arrays. (This technique provides cumulative allocation measurements, not live data measurements, because it doesn’t know when these arrays are freed. Nonetheless, it was good enough.) I used this data in the first three optimizations. Another trick involved modifying jemalloc, the heap allocator that Firefox uses. I instrumented jemalloc’s huge_malloc() function, which is responsible for allocations greater than 1 MiB. I printed the sizes of allocations, and at one point I also used gdb to break on every call to huge_malloc(). It was by doing this that I was able to work out that we were making five copies of the RGBA pixel data for each image. In particular, I wouldn’t have known about the C++ copies of that data if I hadn’t done this. Finally, while looking again at about:memory, I saw some entries like the following, which are found by the “notable strings” detection. It doesn’t take much imagination to realize that strings were being built up one character at a time. This looked like the kind of thing that would happen during tokenization, and I found a file called parser.js and looked there. And I knew about SpiderMonkey’s optimization of string concatenation and asked on IRC about why it might not be happening, and Shu-yu Guo was able to tell me about the threshold. Once I knew that, switching to use Array.join wasn’t difficult. 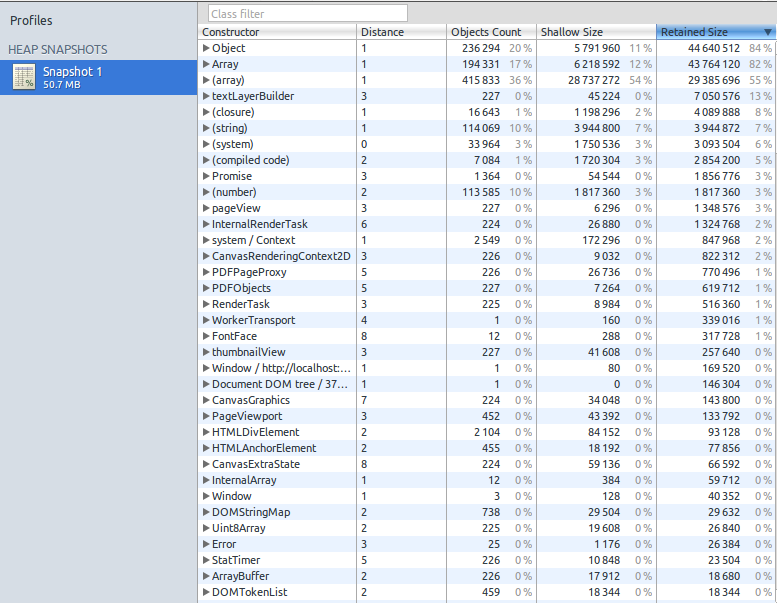 What about Chrome’s heap profiler? Remember the 226 page scanned document I mentioned earlier, where over 7,200 MiB of pixel data was created? I loaded that document into Chromium and used the “Take Heap Snapshot” tool, which gave the following snapshot. At the top left, it claims that the heap was just over 50 MiB in size. Near the bottom, it claims that 225 Uint8Array objects had a “shallow” size of 19,608 bytes, and a “retained” size of 26,840 bytes. This seemed bizarre, so I double-checked. Sure enough, the operating system (via top) reported that the relevant chromium-browser process was using over 8 GiB of physical memory at this point. So why the tiny measurements? I suspect what’s happening is that typed arrays are represented by a small header struct which is allocated on the GC heap, and it points to the (much larger) element data which is allocated on the malloc heap. So if the snapshot is just measuring the GC heap, in this case it’s accurate but not useful. (I’d love to hear if anyone can confirm or refute this hypothesis.) I also tried the “Record Heap Allocations” tool but it gave much the same results. These optimizations have landed in the master pdf.js repository, and were imported into Firefox 29, which is currently on the Aurora branch, and is on track to be released on April 29. The optimizations are also on track to be imported into the Firefox OS 1.3 and 1.3T branches. I had hoped to show that some PDFs that were previously unloadable on Firefox OS would now be loadable. Unfortunately, I am unable to load even the simplest PDFs on my Buri (a.k.a. Alcatel OneTouch), because the PDF viewer app appears to consistently run out of gralloc memory just before the first page is displayed. Ben Kelly suggested that Async pan zoom (APZ) might be responsible, but disabling it didn’t help. If anybody knows more about this please contact me. Finally, I’ve fixed most of the major memory consumption problems with the PDFs that I’m aware of. 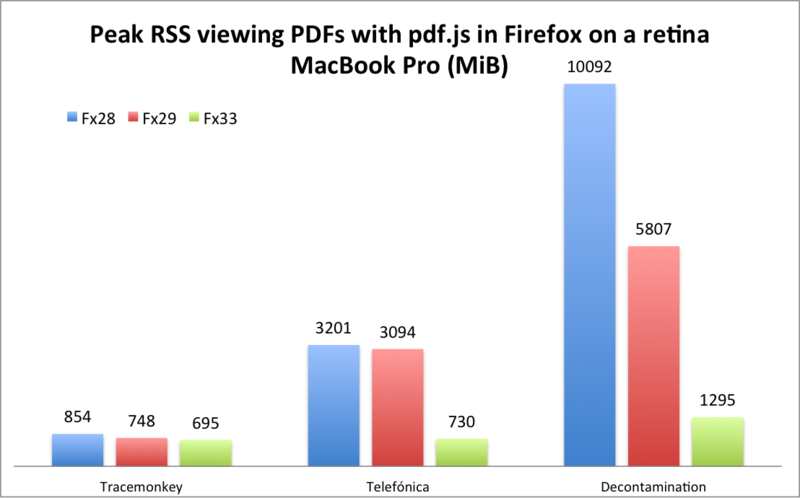 If you know of other PDFs that still cause pdf.js to consume large amounts of memory, please let me know. Thanks. People frequently ask me for status updates on generational GC, and I usually say I’ll tell them when something notable happens. Well, something notable just happened: exact rooting landed. What is exact rooting? In order to support generational and/or compacting GC, you need to be able to move GC-allocated things such as objects around. This means you can’t have raw C++ pointers to any objects that might move; instead, you need some kind of indirect pointer that can be updated when necessary. Unfortunately, both the JS engine and Gecko have a lot of pointers to GC-allocated things. The process of checking and converting them has been the main part of a task called “exact rooting”, and that’s what just finished. This has required an enormous amount of what is essentially very tedious work. Jim Blandy summarized it nicely, as follows. I’ve never heard of a major project escaping from conservative GC once it had entered that state of sin; nor have I heard of anyone implementing a moving collector after starting with a non-moving collector. So, doing *both* is impressive. I hope it pays off big! Major kudos to Terrence Cole, Steve Fink, Jon Coppeard, Brian Hackett, and the small army of other helpers who did this. Now that they’ve finished eating this gigantic serving of vegetables, they can move onto dessert, i.e. making the GC generational and compacting.